Last Thursday, Paulo Fonseca’s men claimed a narrow win over Celta. The Orange-and-Blacks have been preparing for the second leg in Kyiv on the pitch of Bannikov training facility. On Sunday, Viacheslav Tankovskyi, Facundo Ferreyra and Dentinho continued recovering from injuries. The Pitmen will play their first European club cup match in Kharkiv. Previously, the team received their opponents in international tournaments at the Donbass Arena in Donetsk and the Arena Lviv in Lviv. Tickets for Shakhtar vs Celta game are on general sale now. Three days after the game with Shakhtar, Celta had another La Liga game. The outfit of Eduardo Berizzo thrashed CA Osasuna 3-0. Halfway through the first half, Sisto rounded off a spectacular move by the Galicians, with the substitutes Jozabed and Aspas getting their names on the scoresheet shortly before the final whistle. The head coach of the Spaniards rotated the line-up and fielded the following players: Blanco, Jonny, Sergi Gómez, Fontàs, Planas, Radoja, Diaz, Sisto (Jozabed, 60), Wass, Bongonda (Hjulsager, 84), Rossi (Aspas, 73). Thanks to the victory over the underdogs, Celta rose by one line in the table, currently ranking ninth. - We need to prepare in a very composed manner. Major matches require the maximum energy. We must have the courage. We are facing a very tough match, but we believe in ourselves and in our cause. Due to being suspended on Thursday, midfielder Nemanja Radoja will not appear in the game. The teams had three meetings (with Celta and Shakhtar winning once each, plus a draw). The goal difference is 1-1. On February 16, the Orange-and-Blacks claimed a narrow away win at Celta. The only goal at the stadium of Balaidos was netted by the debuting Gustavo Blanco Leschuk on 26 minutes. - That’s an unpredictable team who can beat Real Madrid away and be knocked out by Deportivo Alaves just a stone’s throw away from the final. The Galicians were up vs Atletico and lost, conceding two goals in just three minutes. It’s difficult to predict what kind of Celta will appear in Kharkiv. Definitely, they will charge forward. The first leg outcome is positive for us. The Pitmen have more experience in the European competitions, the team launch excellent attacks owing to their pacey players, so Shakhtar are stronger in this regard. The main thing is taking advantage of it and scoring against Celta in the right time, when they try to launch an all-out attack. In the current Europa League season, Shakhtar have claimed nine consecutive wins. Shakhtar’s unbeaten run in all competitions with Paulo Fonseca at the helm includes 26 games: +24=2-0 61:16. 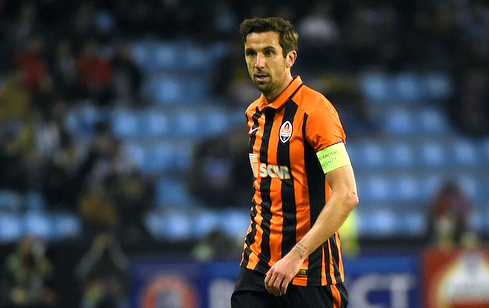 Darijo Srna may make his 50th appearance for Shakhtar in the Europa League (UEFA Cup).